"I am in Las Vegas right now having various discussions and meetings with different people, and we have not closed the door on Floyd Mayweather," stated Manny Pacquiao's adviser, Michael Koncz, during a recent interview on RingTV.com. His carefully worded statements give false hope to those fans who still believe that Pacquiao and Mayweather will finally face each other inside the ring. "I'm here in Las Vegas pursuant to Manny's instructions trying to finalize his next bout. No doors have been shut on any of our options to this point," he continued, suggesting that he has the authority to finalize negotiations with any opponent. The only problem is that Manny Pacquiao is a Top Rank fighter, not a Koncz Promotions fighter, and the only people who do have the authority to finalize a deal with Floyd Mayweather are not actively involved in discussions. According to Ronnie Nathanielsz of PhilBoxing.com, Koncz is allegedly trying to "work out a deal" with Mayweather to face Pacquiao "at the end of May or June 9". Mayweather, however, is scheduled to start serving his 90-day jail sentence on June 1. Considering that his legal team has already made it clear that they don't plan on asking for another extension, it's doubtful that Mayweather will be fighting on June 9, so let's just assume that Koncz is having discussions with him about the May 5 date. While that sounds promising, the fact remains that Pacquiao's promoter, Bob Arum, is the shot caller when it comes to finalizing negotiations for a fight, and thus far, he has yet to make any kind of effort to communicate with Mayweather or his "go-to guy" Al Haymon. During his visit to Mayweather's gym, Koncz gave the impression to Floyd that it was he, not Arum, in control. "Michael Koncz came to my boxing gym to tell me that Bob Arum is not in control. He gonna tell me, 'Bob Arum don't have nothing to do with this at all.' He basically said that Bob Arum is out of there; that Bob Arum is not in control, but he [Koncz] is in control," Mayweather would tell me in an interview two weeks ago. "Then the next time I asked him about Bob Arum, he said, 'Let me handle Bob.' Come on, man, which one is it, let you handle Bob or he's under control? He said, 'Don't worry about nothing. Arum listens to me.'" 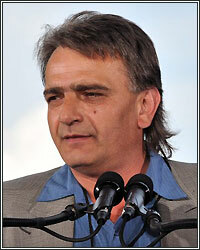 The reality of the situation is that Koncz's statements couldn't be further from the truth. Bob Arum is Manny Pacquiao's promoter, and as such, he has everything to do with this. In fact, I would venture to guess that Michael Koncz probably isn't even allowed to make a move as it relates to Manny Pacquiao's boxing career. As Pacquiao's adviser, he may be able to bring up concerns that his own client may have, but as far as negotiations are concerned, he has no authority to reach an agreement with another fighter. That power belongs to Bob Arum, who made it crystal clear that he's still not interested in making the fight happen on May 5, even after both fighters had their brief conversation on the phone. "The clock is ticking, and that's not good, so we need time to get this thing done, and, you know, the end of May is really rushing it. Maybe Mayweather can get a further postponement from the judge, because it's so big. Or maybe they can each do an interim fight, and we can get together and do the fight in November, but what's going on now is totally and completely ridiculous," Arum would tell RingTV.com not long after Mayweather's call to Pacquiao. "It's absolutely ridiculous. These statements back and forth and this and that, it's crazy, and it doesn't make any sense. Again, it is what it is. The point is that everybody should relax, and we should do what's in the best interest for the fighters and the fans and all of boxing, and that is to have sufficient time to do a promotion and an event that boxing can be proud of." Now, given Arum's statements, does that really sound like Michael Koncz will be able to "handle Bob"? Don't hold your breath! Instead, expect a couple more days of Koncz dropping nuggets about meetings to his go-to writers. Unfortunately for fans, the fact remains, there are no real negotiations taking place. When all is said and done, Koncz will have an explanation as to why a resolution couldn't be reached and Arum will move forward with his announcement that Pacquiao is fighting Tim Bradley. Yep, my money is now on Tim Bradley as Pacquiao's next opponent. Word on the street is that Bradley's co-manager, Michael Miller, has already received a contract for the fight. Plus, I have a funny feeling that Arum would actually prefer Cotto to face Chavez Jr. in July. Meanwhile, Marquez and Peterson will square off in March or April for the right to face Pacquiao in November.